We’d love your help. Let us know what’s wrong with this preview of Singing Meadow by Peri Phillips McQuay. To ask other readers questions about Singing Meadow, please sign up. For 30 years Peri McQuay and her family lived in the idyllic 700-strong village of Westport in Eastern Ontario. Her husband, Barry, was the park supervisor at Foley Mountain Conservation Area, the subject of her first nature-themed memoir, The View from Foley Mountain (1995), and they lived on site amid its 800 acres. The constant push to engage in fundraising gradually made it a less pleasant place to live and work, so as Barry’s retirement neared they knew it was time to find a new home of the For 30 years Peri McQuay and her family lived in the idyllic 700-strong village of Westport in Eastern Ontario. Her husband, Barry, was the park supervisor at Foley Mountain Conservation Area, the subject of her first nature-themed memoir, The View from Foley Mountain (1995), and they lived on site amid its 800 acres. The constant push to engage in fundraising gradually made it a less pleasant place to live and work, so as Barry’s retirement neared they knew it was time to find a new home of their own. 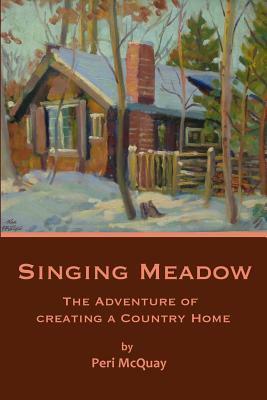 That quest is the subject of her third book, Singing Meadow: The Adventure of Creating a Country Home. My thanks to the author for sending a PDF copy for review. This is a beautiful, beautifully written book. Peri McQuay's loving attention to detail, the luck of finding the right land, finding the way to situate and build her home so that it is close to nature, her appreciation of birds, trees, plants all make this book extra special. Her partnership with her husband, her circle of family and friends who all contribute to the adventure of creating a country home make the book steeped in love.